Today I officially begin my role as a TransCoder1 at Automattic. As a TransCoder, I’ll be doing new and exciting things with VideoPress, our video hosting service. For the last 4 years or so, I’ve been working at MySQL (which was swallowed by Sun, which in turn was consumed by Oracle), based 100% out of my home office. The thread of working as part a distributed company is something I’m very happy to be continuing at Automattic. Impact is cool. 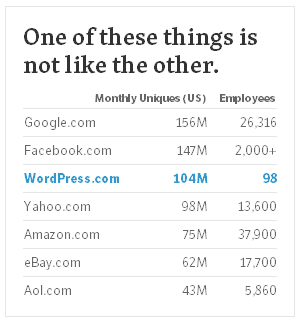 Automattic is around 100 people, but WordPress.com is one of the top 20 websites in the world, getting millions of visitors a day. Look at that employee:visitor ratio in the table over there. Isn’t that a beautiful thing? Getting things done is cool. The smart people at Automattic2 have done a great job of making continuous deployment scale as they’ve grown, so engineers can rapidly develop, launch and iterate features. There’s nothing quite like launching a new feature, seeing it run millions of times an hour, then tweaking it based on how people are using it. Working with awesome people is cool. I’ve had the privilege of getting to know the folks at Automattic recently, and even meeting a few of them. When work turns from the usual day-to-day, into hanging out with friends and doing interesting things, you know you’re onto something. I don’t think I’ve ever worked for a company that has a creed, but I like this one. What will happen to my other projects? PonyEdit development is continuing strongly. We’re working on a bunch of serious performance improvements, expect to see it out soon. Job Manager is slowly waking up from the long winter of bug-fix releases only. With a little luck, I’ll be able to start making some serious inroads on the next feature release. If you want to join in the fun, go and check out our Work With Us page, and apply! You may end up becoming my TransCoding sidekick (we’ll get superhero costumes, and our own theme music). Hey, let me know when we’re getting sized up again, this time we’ll do it properly. With food. And beer.